Actualizado el 28 de marzo, 2018 - 17.10hs. The Production and Supply Planning RFI/RFP Template lists and describes features and functions found in Production and Supply Planning software solutions. This Supply Chain Management (SCM) Template can help you save time, control costs, and communicate clearly with vendors at nearly every stage of your Production and Supply Planning software selection projects. This functional and technical requirement set template covers industry-standard functional criteria of Supply Chain Management (SCM) that can help you easily gather and prioritize your business needs in a simple and categorized excel document. More than a RFP template, it is a working document that serves as a knowledge base reference throughout the life-span of your Supply Chain Management (SCM) software project. Use this template to gather your Supply Chain Management (SCM) requirements, build RFIs and RFPs, and track the progress of your software implementation. Identify and prioritize the features and functions you need instead of building a list from scratch. Easily add your company's unique Supply Chain Management (SCM) requirements. Find out what features and functions vendors support, and how they support them. Improve vendor participation by issuing RFIs that vendors can understand, and respond to easily. Use RFI responses to create lists of requirements for your RFPs or requests for quotation (RFQs). Make sure that vendors understand and can support all your requirements. Get a clear picture of any required customizations. Help Supply Chain Management (SCM) vendors accurately cost required development work. Compare your existing systems to the winning solution (gap analysis). 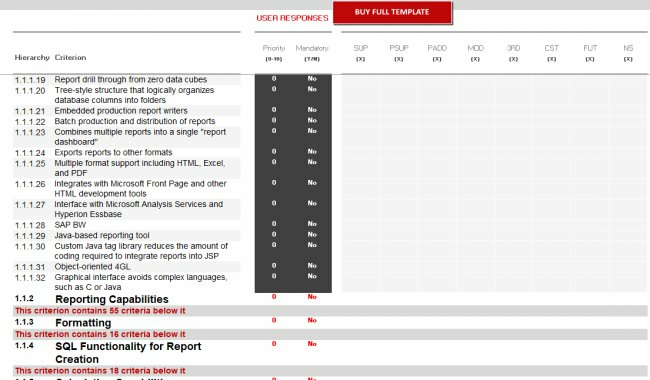 All of ERP-SPAIN.COM RFI/RFP Templates are delivered to your in-box as Microsoft Excel spreadsheets so you can easily share and customize them.